And here again… the video first, or last, or whatever you like. Then again, this is a bit of a long one. I covered a few miles here and experienced a lot of things. I left Dawson Creek early in the morning and I find that when I do that, leave early, I often have the roads all to myself for miles and miles. It’s sometimes scary considering the remoteness, it’s also sometimes quite lonely, but more often than not, I relish the solace. This day was like the latter. I started enjoying the aloneness of it all in between start and stop points. Any-hoo, I was making my way north with a plan to get to Fort Nelson where I could hole up for a night in a non-descript cheap hotel. But I did get to park under an awning! The next day, I made my way through some construction that had the roads pretty torn up. 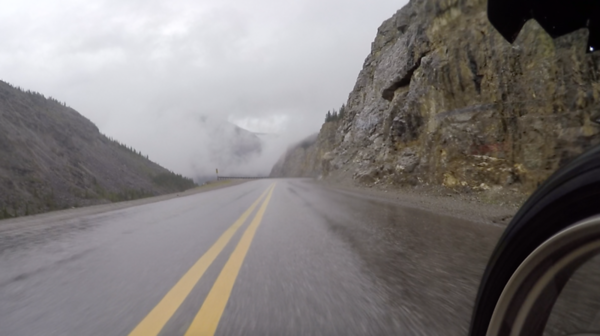 It was in northern BC that I started experiencing more and more waits for pilot cars to lead folks over long stretches of roads under construction. But, the scenery was great, that is when I could see it through the fog and rain. 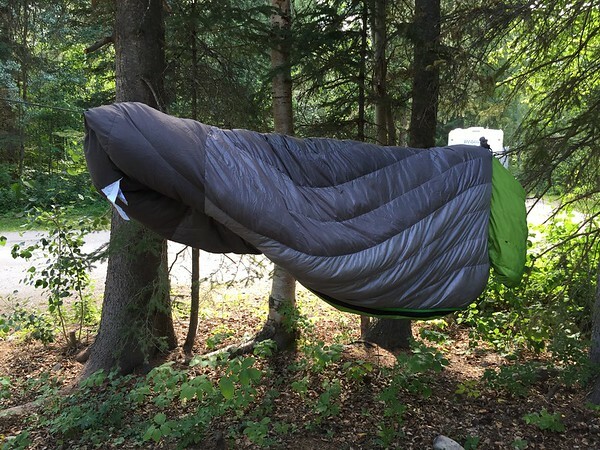 I camped that night in Liard River Hot Springs Provincial Park, and the first thing I had to do was dry out my sleeping bag, which got wet from the rain leaking into my panniers!! 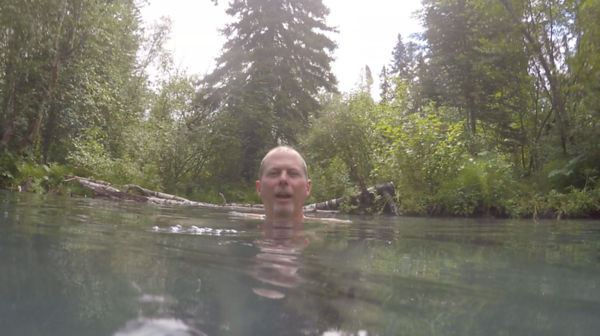 The Liard Hot Springs are fed continuously from an underwater spring with the feed end about 120 degrees and the other end about 100 degrees. I stayed in the relatively cooler end. 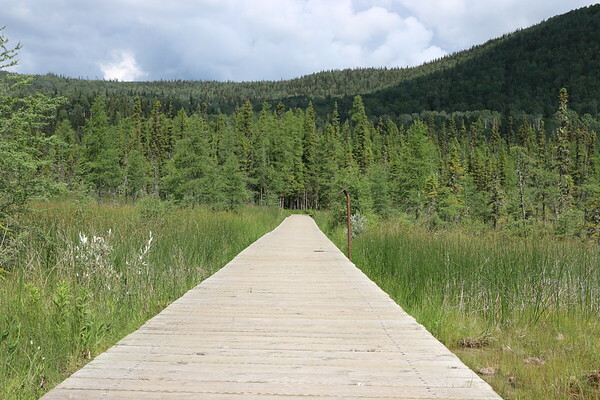 While at the park, one of the rangers told the story of a very recent black bear attack on two folks walking down the very boardwalk I had walked earlier – without my bear spray!! 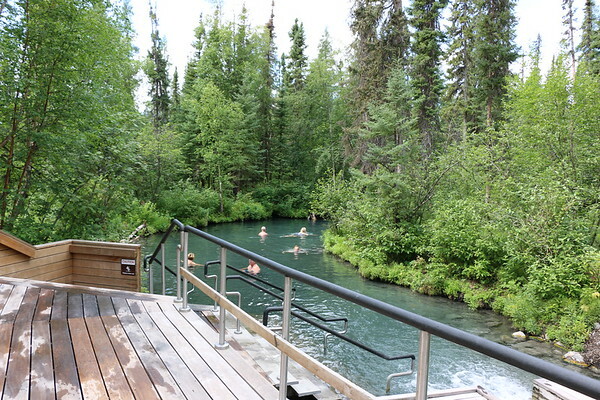 There is nothing at Liard beyond the peace of the campground, hot springs, and an awesome burger truck. 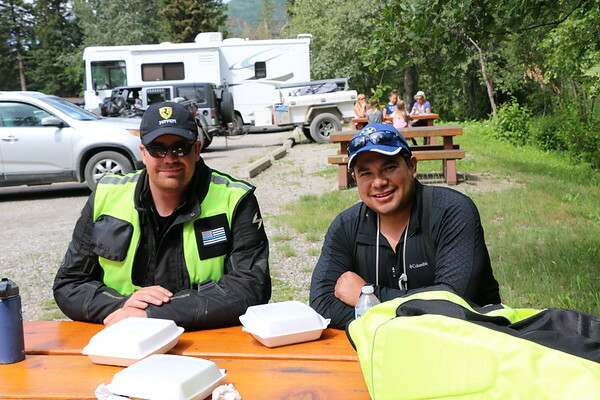 Here, I had lunch with Mark (left) and Lenin (right), on their own trip into the Yukon and Alaska and back. 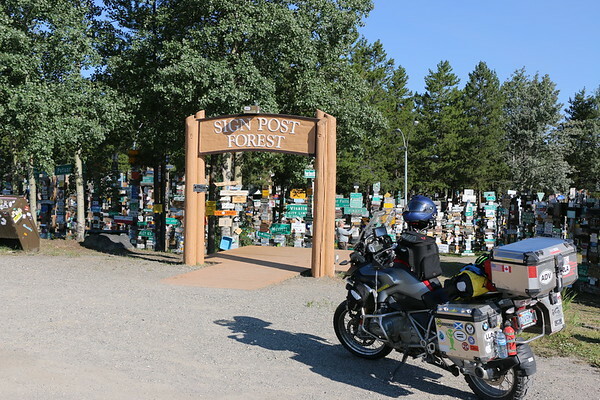 The next day, continuing along the Alaska Highway, I made it into the Yukon and over to Watson Lake, where I stopped by the Signpost Forest. You kinda have to, right? 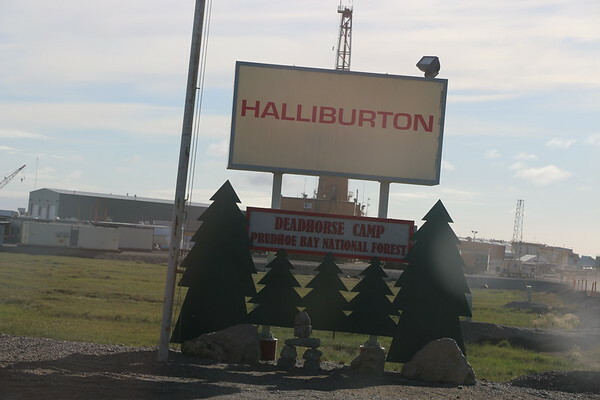 Plus, it’s right on the Alaska Highway in Watson Lake. That night, I had planned to stay in Watson Lake, but it was still early when I arrived, so I pushed onto Whitehorse for the night and grabbed a hotel. 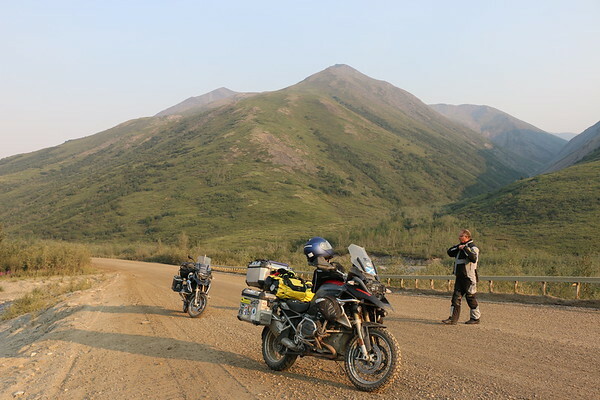 The next day, I left the Alaska Highway and instead headed up the Klondike Highway toward Dawson. 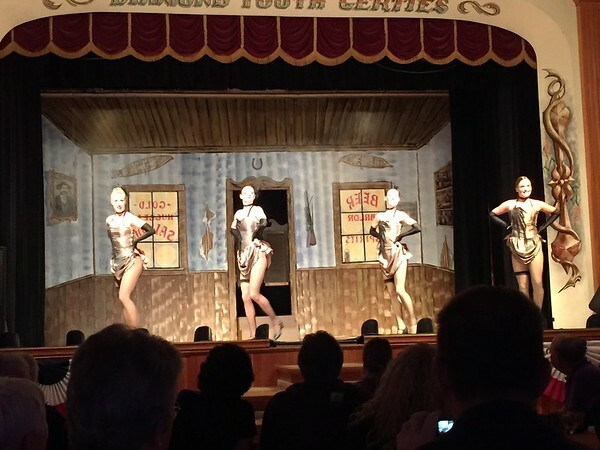 Dawson is a fun little town on the Yukon River that got its start as a mining town, and still is in many ways, with boardwalks and dirt streets. Seems many people are fascinated by the place as it is quite touristy. 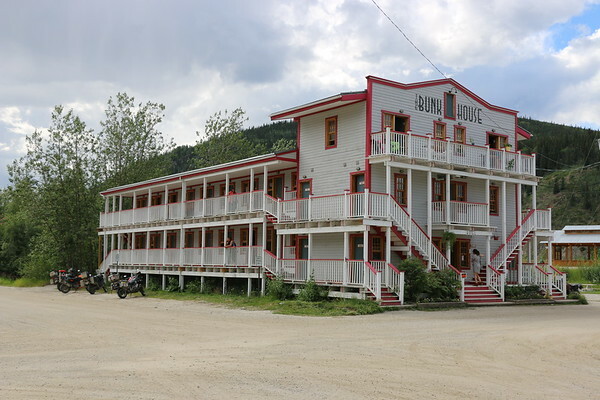 I stayed at the Bunkhouse and relaxed in town for two days. If you ever make it there, make sure to catch the show at Diamond Tooth Gerties and check out the Pit, a rather eclectic bar. 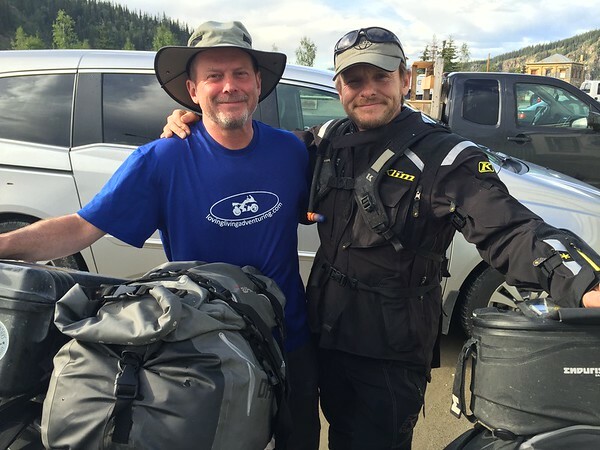 I also ran into Jason Spafford, who with Lisa Morris, just finished a two and half year Argentina to Deadhorse run. Make sure to look up Jason’s photos – best ever. 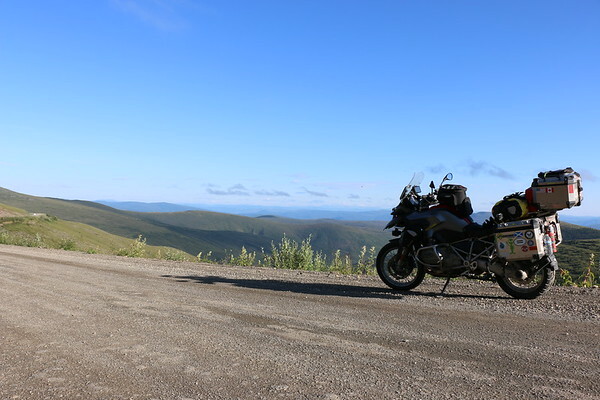 I was excited about the next day – the Top of the World Highway. 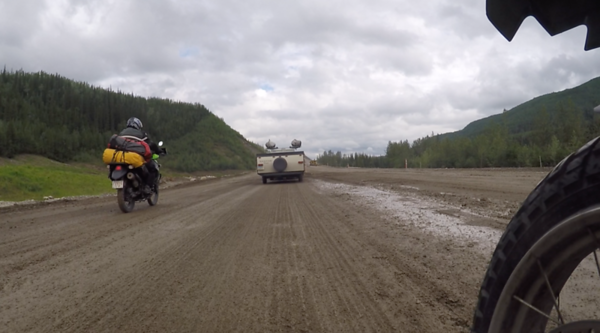 After leaving Dawson via ferry, I was soon on my longest dirt road to date, about 100 miles (including the Taylor Highway). Left Tok and headed toward Fairbanks, where I booked a night in the Eielson Air Force Base lodging. Here is where I met Brian, someone I have been communicating with for about six months to meet in almost this very spot. 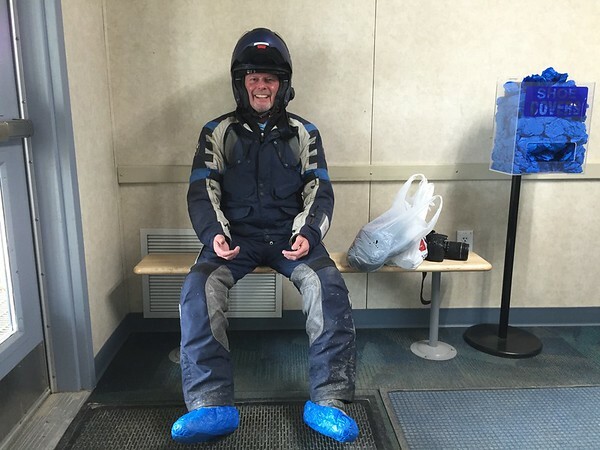 Brian is also on a long journey about the world on his motorcycle solo, but in his case indefinitely! Make sure to check out his blog as he makes much more frequent updates than I do, haha!! 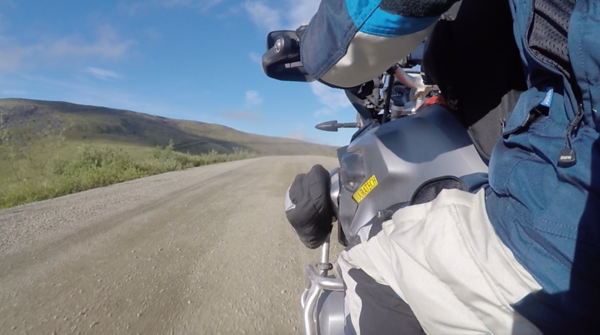 Our plan was to buddy up to tackle the Dalton Highway up to Deadhorse and back. 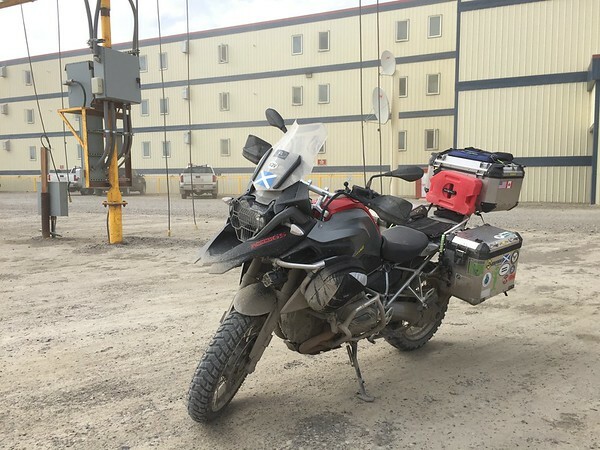 The next day we left early aiming for Wiseman, a small, well you can’t really call it a town, let’s just say place, about halfway between Fairbanks and Deadhorse or about 185 miles up the Dalton Highway. Before we got there, we stopped in at the Arctic Circle for yet another mandatory phot op. 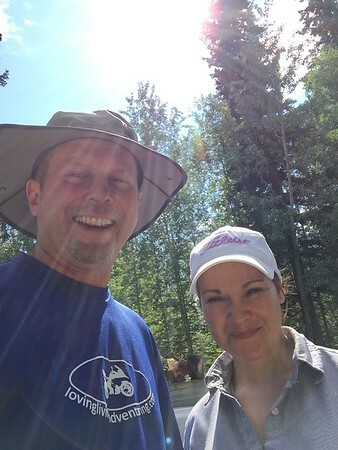 That night, we stayed at the Boreal Lodge. I had trouble sleeping that night worrying about the rest of the Dalton up to Deadhorse, the “harder” part I supposed. South of Wiseman was not really challenging at all as all the stars aligned, I guess – the weather was good, construction was at a minimum, the road was in great shape. And the scenery was amazing! So, we took off on another wonderful weather day and made it within 30 miles of Deadhorse before my hopes of smooth sailing were crushed. Those last 30 miles turned out to be everything we’d heard, pure pain– stretches of monster gravel, deep medium sized gravel, fresh noncompacted dirt. I was too busy trying to avoiding toppling over to catch a picture (I do have plenty on the return trip – next episode). I avoided at least a dozen falls. We booked into the Aurora Hotel, one of those pre-fab deals built block by block above ground. Although it didn’t look like much from the outside, the inside was very nice with rooms akin to a cruise ship. For the price, $150/night, it’s all inclusive, meaning you can eat all you want, even during non-meal hours. Internet and laundry are also free and TV had all the movie channels. This type of hotel caters to oil production crews who rotate in and out, so it has everything they need. We stayed for two nights so that we could relax a bit. 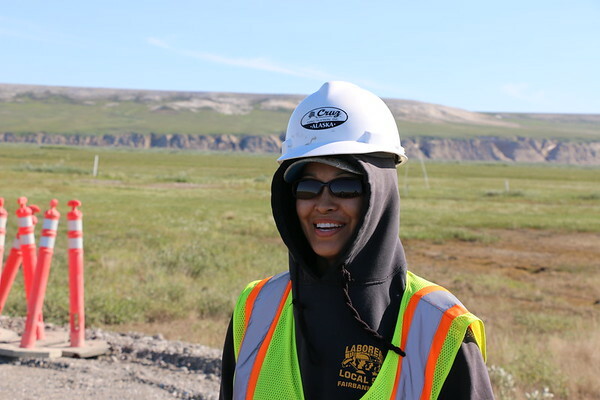 The next day, we hopped on a bus to tour the oil production facilities and visit the Arctic Ocean. 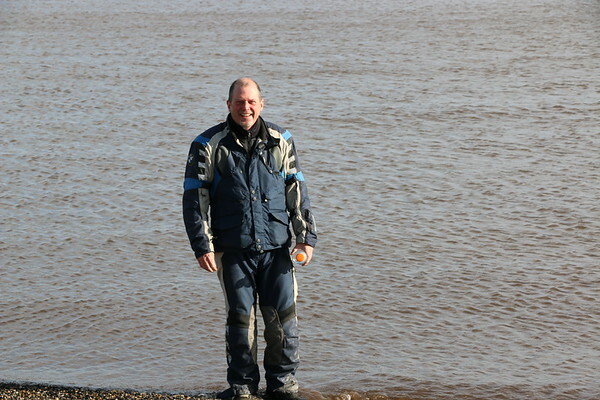 It was kind of cool standing in the Arctic Ocean knowing my trip will take me to the other end of the Pan-American Highway next year. 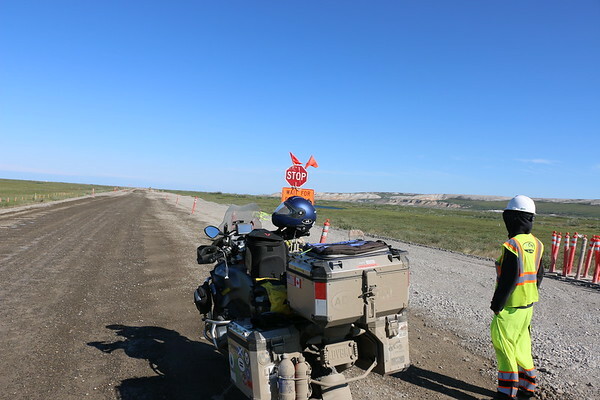 The rest of the afternoon in Deadhorse, we heard no less than 10 stories about motorcycles coming up to Deadhorse, and all the stories had unhappy endings – broken ribs, life flights, bike shipped back to Fairbanks. 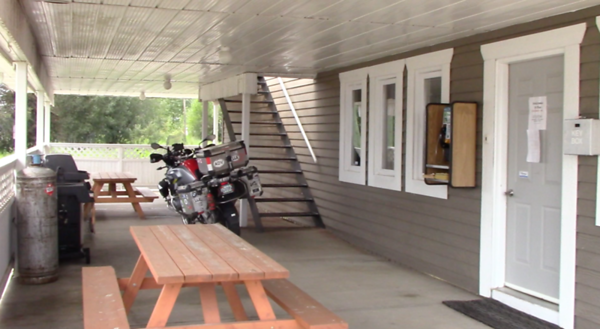 I’ve read many accounts of people coming to Deadhorse on motorcycles and I never heard it was easy. My particular trip up, however, was not bad at all except for the hell of the last 30 miles. As I said, I think I was lucky everything just worked out. If the weather were bad during, or if there’d been a lot of rain in the preceding days, I am pretty sure my ride would have been very different. That’s it for now. I made it to the top of the world. Next, I’ll be headed south. 1) The further north you go, the more expensive everything is – everything is WAY more expensive, gas, food, and especially lodging. 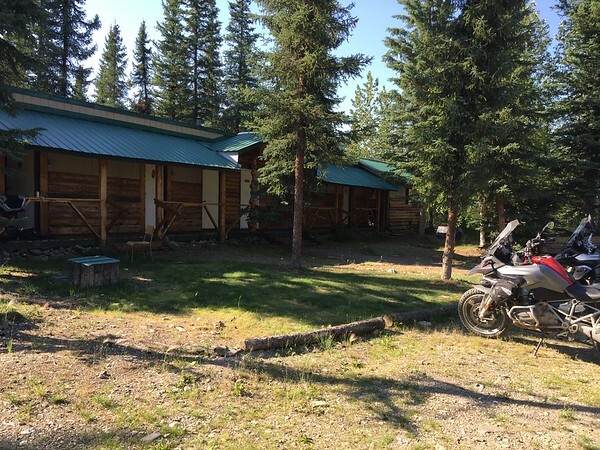 At the Boreal, we shared a small room with two twin beds barely big enough for two people and the bathrooms were shared with everyone. 2) If you’re heading to Deadhorse, the last stop to buy ‘take-away’ beer is Fairbanks. You can ‘get’ a beer or more in Coldfoot, but you have to drink it there. You can’t walk in and buy a six pack to go. And, Deadhorse is a dry town.